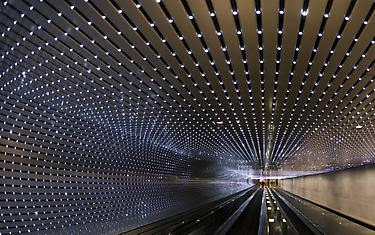 The National Gallery of Art, Washington, DC has acquired for its permanent collection Leo Villareal's installation Multiverse. Multiverse is Villareal's most complex project to date. Measuring 200 feet long, the installation has 41,000 light emitting diodes individually sequenced by through his custom computer programs. Villareal is represented locally by Conner Contemporary, which helped to facilitate the acquisition. Who's that on the cover? Port of Harlem magazine's issue on photography features New York-based Mireille Liong-A-Kong, and my good friends and Washington-based photogs Bruce McNeil and Camille Mosley-Pasley as well as Jason Miccolo Johnson. That's Camille, Bruce and Jason on the cover. Mosely-Pasley has also shot images that have graced the magazine's covers in the past.